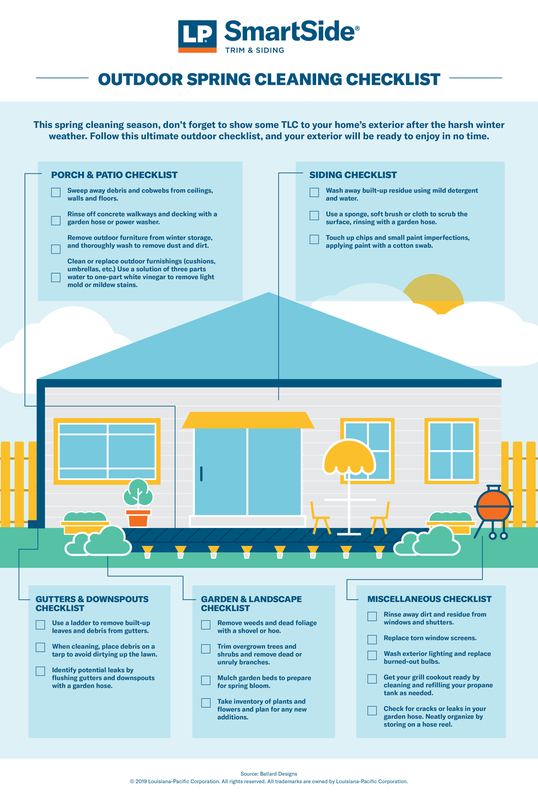 Lucky for you, we put together an easy-to-read outdoor spring cleaning infographic. Grab your pen, take a read and you’ll be checking things off the list in no time. Here’s a peek of what’s in store. Rid the signs of winter by sweeping away debris and cobwebs from your porch and patio. Don’t underestimate the power of rinsing your walkway and dusting off outdoor furniture. Given the ideal weather, spring is the perfect time to take inventory of your home’s siding. We recommend washing LP® SmartSide® siding annually to remove the natural build-up of dirt and grime to prevent mildew and mold damage. Stay ahead of spring showers by removing built-up leaves and debris from your gutters. Also, flush gutters and downspouts with a garden hose to identify and fix potential leaks. Make your home’s outdoor area a place you want to spend time. Make sure the aesthetic is just right by removing weeds, trimming greenery, mulching your garden beds and planting flowers for a colorful springtime bloom. Windows are a focal point of your home’s exterior. Give them a wash to remove wintertime residue and replace torn screens. Also look at replacing light fixtures and refilling your grill’s propane tank for springtime cookouts. You’re officially ready to get started! Take this list, check it twice and your home’s exterior will be in prime condition to enjoy this spring and beyond. Manufactured with engineered wood strand technology, LP® SmartSide® Smooth Trim & Siding provides the advanced durability building professionals have come to expect with the distinctive beauty homeowners appreciate. First impressions are everything, and a home is no exception. More than 65% of buyers cite curb appeal as the most important aspect of a home’s exterior design. But you’d be wrong to think curb appeal is just an issue for sellers. Maintaining a home’s outward appearance means increasing property value, and that’s a win for both homeowners and builders.